Paradoxically, rowing is as simple as Paul O’Donovan describes and yet, at the same time, fiendishly complex. But like many new skills, it’s easy to become competent and difficult or perhaps impossible to ever fully become a master – the hardest part in my view is simply having the courage to take the first step and give it a try. I first sat into a rowing boat almost 20 years ago and like many rowers, I can vividly remember my first time on the water. It was a thunderbolt moment for me and I was hooked by the time I returned to the bank. Rowing is infectious and few remain immune once they are exposed. Many years on from that sunny day on the river Liffey in Dublin and I’m still enthralled by this sport, whether I’m sitting in the boat or coaching from the bank. Rowing is not just for the young, the super fit or the manically competitive – as many in our club will be happy to demonstrate, myself included. Though there is no doubt rowing will make you fitter, stronger and may foster a certain competitive streak. And while learning, there is almost no need to pull like a dog! Initially it’s all about technique. Almost anyone can take part. You don’t need to be up at the crack of dawn every morning nor do you need to eat kilos of pasta. You do need to be willing to learn, and a positive attitude helps. Confidence and ability is built incrementally. The benefits are beyond doubt – not just physically, but also holistically. A rudimentary knowledge of the basics of rowing is enough to open the doors to a welcoming and friendly environment, a communal feeling of belonging and achievement, and the infectious excitement of racing side by side. This can all be achieved with a small amount of coaching within a very short period of time and instead of watching the Boat Race on tv, you may be rowing at events over the same water within a matter of months. Rowing has a level for everyone. 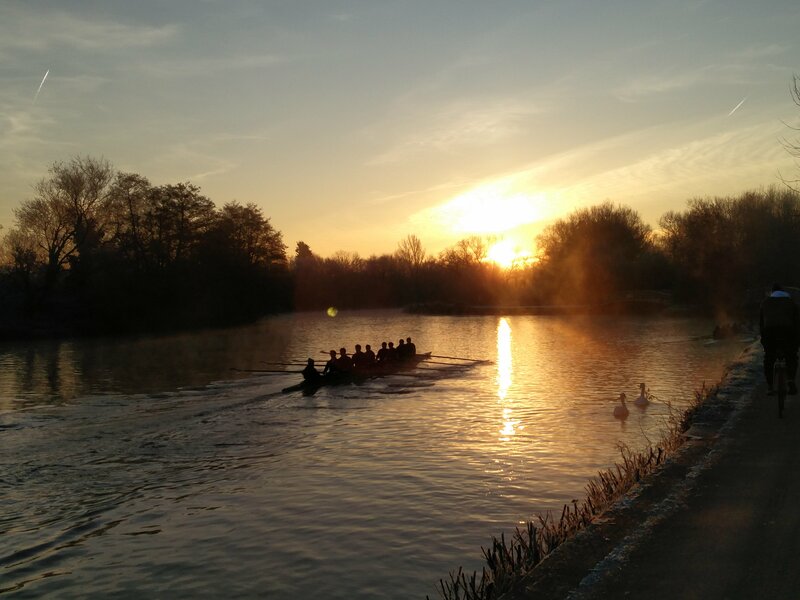 While for some, the goal is indeed to take part at regattas and events around the country, many simply enjoy the experience of getting out on the river of an evening or at the weekend in a social way to enjoy the camaraderie and peacefulness of the river on a sunny day. Even if you find that rowing itself isn’t for you perhaps you might be better suited to coxing or volunteering with the club in another way. Yes, it rains sometimes. No, it’s highly unlikely that you’ll fall in (though if you do you and your coaches will know what to do). Yes, you may become obsessed by it, and No, it never really gets that cold. So I say, be brave, take the first step and learn to row and if you do your efforts and enthusiasm in learning will be matched by ours in coaching. Ultimately, I believe the appeal of rowing is bound up in the friends you make, the good (and occasionally) bad times you share together and the enduring optimism that grows in everyone who holds an oar that one day soon you and your friends will get from point A to point B ‘fashter’ than everyone else. (*) Rob Grimes coaches the Oxford Academicals men’s squad and formerly of University College Dublin Boat Club.